Given that the Washington D.C. Court of Appeals today smacked down the FCC’s ham-handed attempt to impose net neutrality rules on Comcast from a couple years ago, it’s no surprise that many folks are proclaiming this to be the end of net neutrality and a blow to the Obama administration’s telecom plans. All this does is mark the start of the real battle for not just net neutrality, but for control over matters broadband and beyond. In reality, today’s decision is probably a somewhat welcome one for the Julius Genachowski-led FCC and the Obama telecom troops, since it officially removes the taint of questionable decisions led by former FCC chairman Kevin Martin from the net neutrality debate. Martin, the friend of big telcos like AT&T and Verizon, ostensibly presided over the implementation of the net neutrality “principles” back in 2005 and then the Comcast case itself. But being by all accounts a very smart guy, Martin is probably laughing out loud somewhere now, knowing that his tactics and decisions probably got the end goal he and his backers truly wanted — mass confusion around net neutrality and the FCC’s role in adjucating it. Though we’ve sort of been off the policy beat lately, I remember asking lots of insiders about the Comcast decision after it was initially passed, and even the most pro-net neutrality types all thought it would eventually be overturned like it was today. “Good result, bad process” was the way one net neut proponent summed up the original FCC ruling. Good call. But since Obama’s election, Genachowski and other administration types have been busy looking well beyond the Comcast case, putting in motion not only a separate net neutrality proceeding, but also developing the recently released national broadband plan, which if executed as described will go a long ways toward making net neutrality principles part of everyday regulatory practices — not by trying to define the slippery idea of net neutrality itself but by implementing a raft of actual measurable, enforceable things like truth in broadband-speed advertising and transparency in network management practices. Should the broadband plan’s metrics-based ideas come to pass, network service providers would have a hard time hiding the kind of dubious practices that got Comcast in hot water in the first place. And just like with the health care bill, Obama and the Democrats probably have all the votes they need right now to pass new net neutrality regulations should they so desire — in fact insiders we have talked to in the big telco camps fully expect that some sort of net neutrality regulation will appear before the end of the year. But that also means they’re gearing up to fight it, if for no other reason than to keep the nuns safe from Google. We digress. Clearly there is much more still to happen, and we’ll be watching while it does. But the end of net neutrality? In reality, a much bigger battle for the ultimate control of the nation’s networks has just begun. We’re just starting to scratch the surface of the FCC’s National Broadband Plan, but from our limited-view vantage points we’ve already identified a few flash points that will no doubt be the center of much discussion at next week’s big wireless trade show in Las Vegas — including a call for freeing up 300 MHz of wireless spectrum by 2015, with 120 MHz coming from over-the-air broadcasters; and a huge move toward gathering and exposing more data about spectrum license holdings and actual wireless-service metrics, which with any hope will put a welcome end to stupid Map Wars TV ads that mess up our sports viewing. On the spectrum front — hey we told you this stuff was important! — the battle for licensed airwaves is likely to make any past wrangling over tedious topics like net neutrality look like a preschool playground when you forsee a lobbying smackdown between the big telcos (who want more spectrum) and the broadcasters (who will fight to not give their airwaves up). Attention recent law school graduates! Best to bone up on spectral-rights history, because your billable hours will soon be needed. More importantly for the rest of us is the plan’s welcome focus on a topic we’ve long been sore about, the fudging and obfuscating that is the norm when it comes to wireless service plans. 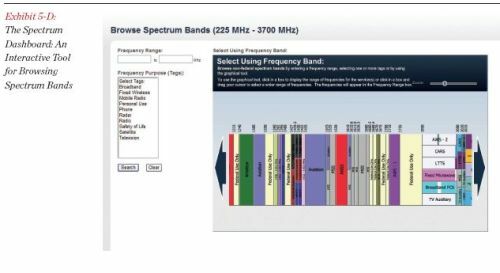 Our quick summation of the FCC’s well-reasoned quest to standardize, collect and expose wireless service parameters: When you buy a gallon of gas, you are somewhat assured you are getting the octanes you paid for thanks to government regulations and standards on weights, measurement and quality of fuels. Consumers can choose their provider based on standardized data and pricing, market forces at their best. In the current iteration of wireless services, we are at the stage of Put a Tiger in your tank. Cloudy descriptions of “peak” service levels and confusing data/minutes/messaging plans purposely make it almost impossible for consumers to compare services or providers. 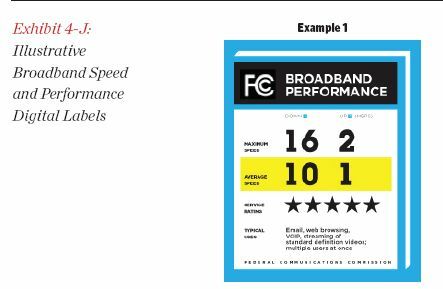 Under the Plan, the FCC would change that by establishing “technical broadband measurement standards” and by publishing actual broadband delivery data — maybe even a label (see below), like the ones that tell us how many calories are in that “healthy” toaster pastry — make it so, make it so! We also like the bit in Chapter 5 of the report where the FCC calls for the establishment of an online spectrum license search tool (unauthorized PDF grab below) that would make our lives, and the lives of telecom researchers everywhere easier by actually letting the public know who is in control of those most precious of national assets, our electromagnetic airwaves. For this bit alone, hell yes we like the plan. As Eric Schmidt says, Onward!